Camps for Russian prisoners and internees in Poland that existed during 1919-1924 housed two main categories of detainees: the personnel of the Imperial Russian Army and civilians, captured by Germany during World War I and left on Polish territory after the end of the war; and the Soviet military personnel captured during the Polish–Soviet War, the vast majority of them captured as a result of the battles of 1920. Locations of the camps included Strzałkowo, Pikulice, Wadowice, and Tuchola. Due to epidemics raging at the time, made worse by the very bad sanitary conditions in which the prisoners were held, largely due to overcrowding, between 16,000 and 20,000 Soviet soldiers held in the Polish POW camps died, out of the total of 80,000 to 85,000 prisoners. During the Polish-Soviet War, between 80,000-85,000 Soviet soldiers became prisoners of war, and were held in Polish POW camps. The conditions in these camps were bad, as the newly recreated Polish state lacked many basic capabilities and had few resources to construct them. Thus, the existing camps, many of which were adapted from World War I German and Russian facilities or constructed by the prisoners themselves, were not adequate for holding the large number of prisoners, who suffered from hunger, bad sanitation and inadequate hygiene. Between 16,000-17,000 (Polish figures) and 18,000-20,000 (Russian figures) died, mostly as a result of harsh conditions and epidemics which raged in the camps. Before publications of new findings in Russia in 2004, some Russian sources gave much inflated numbers for prisoners and the death toll (up to 165,000 and 70,000), respectively. This matter caused much controversy between Poland and Russia. During a war between two countries experiencing great socioeconomic difficulties, and often unable to provide adequately for their own populations, the treatment of prisoners of war was far from adequate. The bad conditions in these camps were known to public opinion in Poland at the time, as a number of Polish newspapers openly wrote about them, criticizing the government for not correcting the situation. In modern times the issue has been addressed in a number of scholarly publications. The issue of the actual number of prisoners and their estimated death toll was settled long after the fall of Communism in Eastern Europe. A joint team of Polish and Russian historians published results of their findings in 2004, after reexamining documents from the Polish and Russian archives. The commission included Prof. Waldemar Rezmer and Prof. Zbigniew Karpus from Nicolaus Copernicus University in Toruń as well as Prof. Gennady Matveyev from the Moscow State University. Their research revealed that the number of Russian POWs can be estimated at between 80,000 and 85,000, and that the number of deaths in the camps can be estimated between 16,000 (Karpus, Rezmer) and 20,000 (Matveyev). Existing documents disprove the allegations by Soviet ideologues, that the Russian POWs were exterminated. The prisoners' nationality, religion or other issues had no bearing on their POW status. The archives prove that the cause of death were epidemics of influenza, typhus, cholera and dysentery. Infectious diseases took a heavy toll on active soldiers and the civilian population as well. The Russian representative in the commission, Matveyev, rejected the joint statement two years later in 2006 increasing the number of prisoners by 40 percent. Until the source documents were published in Moscow in 2004, some Russian historians had estimated the number of prisoners and the death toll to be much higher, estimating that the death toll ranged from 40,000 to more than 100,000. For example, Irina Mikhutina in her 1995 publications estimated the number of prisoners to be 165,000 and the death toll to be 70,000. 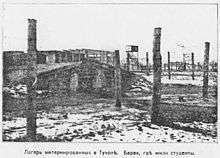 In 1998 Russian popular press reported that Polish internment camp in Tuchola was particularly notorious for the large number of Soviet POW's deaths and was dubbed a "death camp" by the Russian Emigrant press from within Poland. There have also been accusations from the Russian side that the death toll was influenced by the indifference of the camp authorities. Other historians have also noted that Russian historians used those numbers to justify the World War II Katyn massacre of Polish officers and intelligentsia by the NKVD. Such usage has become known as "Anti-Katyn". The Russian historians arrived at this number by first estimating the number of POWs, then subtracting the number that has been repatriated to the Soviet Union after the hostilities ended, and then assuming that most of the remainder died in POW camps. Polish historians always countered this by arguing that: (a) the number of POWs was very difficult to estimate accurately, due to the chaotic situation prevailing for most of the war, and (b) many Soviet POWs lost that status after they switched sides and entered units fighting alongside Polish forces against the Red Army, or were transferred to the Whites rather than the Bolsheviks. There was also the problem that significant number of Russian POWs were left in the territory of Poland since World War I (about 3.9 million soldiers of the Russian Empire were taken captive by the Central Powers) and obviously when the Polish-Soviet conflict deteriorated, these POWs were not released to Russia. According to Polish historians Karpus and Alexandrowicz, similar number of Polish POWs died in Soviet and Lithuanian camps from 1919 to 1922 - about 20,000 out of about 51,000 captured. After 1922 the Polish and Russian prisoners were also exchanged among two sides. Ekaterina Peshkova, the chairwoman of organization Assistance to Political Prisoners (Pompolit, Помощь политическим заключенным, Помполит), was awarded an order of Polish Red Cross for her participation in the exchange of POWs after the Polish-Soviet War. The Russian Society of Military History called for a Kraków memorial of the Russian victims. In 2014, the Polish Ministry of Foreign Affairs published further archival documents of International Red Cross and League of Nations missions that inspected the camps. The newly published documents are mostly in French and English. 1 2 3 4 5 6 POLISH-RUSSIAN FINDINGS ON THE SITUATION OF RED ARMY SOLDIERS IN POLISH CAPTIVITY (1919–1922). Official Polish government note about 2004 Rezmar, Karpus and Matvejev book. Last accessed on 26 May 2006. ↑ The conditions of life in Poland in the early post-World War I period, as described by the British Director of Relief: The country...had undergone four or five occupations by different armies, each of which had combed the land for supplies. Most of the villages had been burnt down by the Russians and their retreat (of 1915); land had been uncultivated for four years and had been cleared of cattle, grain, horses and agricultural machinery by both Germans and Bolsheviks. The population here was living upon roots, grass, acorns and heather. The only bread obtainable was composed of those ingredients, with perhaps about 5 per cent of rye flour. In: Derek Howard Aldcroft. Studies in the interwar European economy. Ashgate. 1997. p. 14. 1 2 Karpus, Zbigniew, Jeńcy i internowani rosyjscy i ukraińscy na terenie Polski w latach 1918-1924, Toruń 1997, ISBN 83-7174-020-4. Polish table of contents online. English translation: Russian and Ukrainian prisoners of war and internees kept in Poland in 1918-1924, Wydawn. Adam Marszałek, 2001, ISBN 83-7174-956-2. ↑ (Russian)Nezavisimaya Gazeta, "The tragedy of Polish captivity", July 16, 1998. ↑ "Jeńcy radzieccy w Polsce. Archiwalia Międzynarodowego Komitetu Czerwonego Krzyża i Ligi Narodów.". Ministry of Foreign Affairs of Poland. 2014-10-10. Retrieved 2014-10-11.